The present essay "The Balzac of the Occult (Papus), and the Russian Sphynx (HPB)" is based upon a talk given to a few theosophists in 1992 at Villa Park, Illinois, Lodge AF&AM, as an introduction to the study of The Occult Revolution in France at the end of the 19th century, marking but one of many places globally where that historic renaissance of esotericism gained momentum and prominence. It is reproduced here, in this brief article, to inform students of the Gnostic Church and the co-called "western tradition" of esotericism and in particular the French connection which we assiduously follow. There is currently circulating much misinformation about Madame Helena Petrovna Blavatsky and the Martinist-Gnostic-Rose Croix Masonic movement of France, (led by Dr. Gerard Encausse, otherwise known as Papus to most of us), suggesting HPB's ignorance of this movement, if not actual hostility toward it. These renegade opinions have been set loose from time to time over the last century (since the death of both of these hierophantic figures), and even today where those seeking to evaluate the Gnosis and Gnosticism (some sincerely and other rather insincerely) have rejected HPB's affiliation with and expertise in the Gnostic Revival. To wit two personal friends and colleagues, the late Dr. Phillipe Encause (Papus' son), and the Most Rev. Stephan Hoeller (widely recognized Theosophical and Gnostic scholar) have within the past ten years made literary efforts to remedy the misinformation or in some cases the void (1) of information which had persisted for many decades. The works of both of these Bien Ami Freres are used as a source for the present essay, (2) we highly recommend them. My original talk was entitled "Papus & HPB; The Balzac of the Occult meets the Russian Sphynx", and then as now I am obliged to state that there is no information or evidence whatsoever that these subject personages ever met or for that matter carried on any mutual correspondence with one another. Rather, the following is concerned with how their lives and works, monuments to the renaissance of wisdom and Gnosis in our age, were so interwoven in this physical dimension, indelibly marking their common direction thereupon! As far as can be ascertained with any credibility, both Papus and Madame Blavatsky had the distinction of first seriously recognizing their mystic capacities in the school of Monsieur Leon Revail a.k.a. Allen Kardec. In the case of HPB, she had by the late 1860's or early 70's already toured Greece and Egypt in the company of Paulos Metamon, a mystic Copt and had been received into the Masonic Rite of Mizraim while fighting with Garibaldi in the Italian Civil war. But it was while convalescing from war wounds in Paris that HPB began to experience her psychic abilities in the sense of true development. It was from here that HPB departed for America in 1875 to found the Theosophical Society. Amazingly and but a mere ten years after the departure of HPB from France, the very young medical student Gerard Encausse appears, It is here we can be sure that Papus as HPB before him, became acquainted with the circle of Alphonse Louis Constant a.k.a. "Eliphas Levi", a circle of notoriously committed Alchemists, Rosicrucians, and Martinists and it can be ventured, the Gnostics of the latest epoch. It was amidst this circle that Gerard Encausse was to make acquaintance with Henri DeLaage, his initiateur, who, in 1882, consecrated the young Encausse with the name Papus S.I.! Neither could the influence of this same circle be casually minimized in the case of HPB (who probably came into contact initially with Eliphas Levi in this environs and probably again in the circle of Lady Caithness), for as Dr. Stephan Hoeller has pointed out, HPB quotes Levi (3) probably more than do any of her comtemporaries. In 1887 some five years after Papus' initiation to the S.I. (Martinism), he was introduced by F.K. Gaborian into the company of Lady Marie Caithness, Duchess of Pomar and her circle, which is now known to most in France as le Societe Theosophique d' Orient etd' Occident. 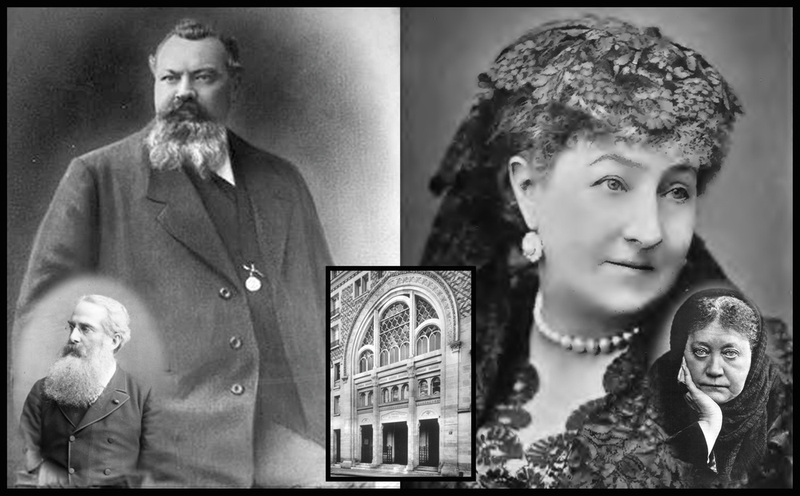 Some five years prior, Madame Blavatsky, Colonel Olcott, and Annie Besant had contracted with the erudite Duchess to form the Frenchartery of the Theosophical Society, already a great success in England and the USA, and I believe that it should be of more than passing interest to students of the Gnostic Ecclesia that in this circle would later come together the ordinands of the celebrated French gnostic Jules Doinel for the first synod of the Ecclesia Gnostica! But as for 1887 this became a year of memorable business for both Papus and HPB as well as for the Theosophical Society internationally and L'Ordre Martiniste of France. The young Papus, only 23 and still a medical intern, became a member of the Theosophical Society in 1887. On October 25, 1887, Colonel Olcott personally announced the election of Papus to the newly formed General Council of the Theosophical Society at Adyar, India and as propagator of Kiato Buddhism for the T.S. At the same time Papus was also elected president of L' Groupe Independent des Etudes Esoterique. This short lived yet highly celebrated association attracted to its ranks many great and popular mystics of France, collectively known as "Les Compagnons de la Heirophonie" and included Victor Michelet, Josephin Peladin, Paul Sedir, Lucien Chamuel, Stanislas De Guata, Albert Poisson, Ch. F. Bartlet (Alfred Foucheux), De la Croze, A. Chaboseau, Phoneg, Silva, Marc Haven, Dr. Rozier, Jollivet-Castelat, etc., men of great knowledge and influence and, like Papus himself, many were Theosophists as well as initiated Martinists of one or another secret chain. In recognition of the importance of this society, Papus in one of his journals (Papus by this times was editor in chief of "The Veil of Isis", a principally theosophical journal and "L'Initiation", a Martinist one), stated that the G.I.D.E.E. was to be the outer court for a greater and higher initiatic order, comprising their recruits from this outer and predomi-nantly theosophically oriented association. Hence, Papus' days in the T.S. were numbered eventually to give way to full time concentration on a society that would unite Martinists into a single organization i.e. L'Odre Martiniste. For HPB, 1887 could have been no less a landmark year as it saw the incorporation of the General Council of the TS at Adyar, and the opening of many new branches internationally. Madame Blavatsky was becoming increasingly more notable and was about to complete her epic work The Secret Doctrine, which she was to finish the very next year. Among the tributes forthcoming, not least among them was the following quotation of Papus, in his own review in the journal L'Lotus Rouge, concerning HPB's works: "As an Initiate of the orient; slandered a little from time to time, Secretary of the Society and a writer and very distinguished author of a work of occultism most admirable--Isis Unveiled... "Among authors of our recollection (she) stands out in joining the practical to the theoretical ... (she) writes articles of remarkable truths not often found in French." Papus held HPB in high esteem, elsewhere calling her a "high initiate", and "destined to influence how the people of the next century shall come to understand the mysteries." Such are certainly not the casual comments of a limp and lukewarm disciple or confrere. No doubt I'm sure HPB herself was aware of this fond and telling accolade! Time moves forward and so does Papus; in 1888 he departs from his Theosophical offices to assume historic grand mastership of the new amalgamation L"Ordre Martiniste (known today as the Martinist Order of Papus) with many of the same figures as cited above. In 1891 L'Supreme Conseil was keystoned upon the whole structure giving it a vehicle for perpetual autonomy, and it has retained to this day the journal L'Initiation as its official organ. In the late 1880's HPB published a series of articles in the British Theosophical journal Lucifer (”light bearer,” literally) in which she made commentary of the ongoing research and the translation of the text of G.R.S. Mead's "Pistus Sophia". This commentary was published in toto (4) by HPB in 1891 the year of her death. It is an unprecedented, concise, and brilliant interpretation of the text, approaching the subject matter from a freemasonic and Buddhist point of view, schools of study not without many adherents (these would include not the last among them, John Paul II, as evidenced by his own categorization of Gnosis in the finale of his own article on Buddhism (5) in his recent book). HPB's own strong encourage-ment of G.R.S. Mead in his ongoing researches is certain evidence of her own enthusiasm for this subject and one can only imagine what other contributions to the Gnostic renaissance may have been forthcoming had she not passed beyond Isis' Veil in May of that year (1891)! Madame Blavatsky left the world in 1891, but, though gone, was not forgotten, Papus himself eulogized the Russian Sphynx as a 'great oriental initiate' in the 1893 edition of L'Initiation. Papus by this time was on his way to becoming quite the globe trotter in the evangelization of much of Europe, but especially Russia in the cause of Masonry, Martinism, Gnosticism and I dare say 'Theosophy'. However it may be to the onlooker, it was the last years of HPB's life that hold the most remarkable destiny for a Gnostic renaissance. In May of 1890 (though specific dates vary) it appears that a certain librarian and antiquarian, Jules Doinel, who supposedly came upon a mysterious document of gnosticism the year before, attended a seance of sorts in the oratorie of the Duchess of Pomar (The Countess of Caithness), the same oratorie that over the years served as the primary meditational sanctuary of L'societe d’Theosophique of Paris, where an extraordinary event occurs to Monsieur Doinell. At this particular sitting it appears that the disembodies spirits of ancient Albigensians, joined by a heavenly voice, laid spiritual hands on Doinel, creating him 'Valentinus, . . . Bishop of the Holy Assembly of the Paraclete and of the Gnostic Church', and that he was to be provided with a female assistant, a 'Helen' who would serve as his oracle. He was further directed to consecrate as auxiliary of Bishops; Papus (Tau Vincent), Paul Sedir (Tau Paulas), and Lucien Chamuel (Tau Bardesanes). In the year 1892 Doinel consecrated other well known personages of the Parisienne societe including Dr. Louis-Sophrone Fugarion (Tau Sophronius), Albert Journet (Tau Theodotus) and Lady Marie Charivel do Chauvigny (as Esclaremonde, the first 'Sophia' to be consecrated). On September 18, 1892 the first Synod was held, at which time the symbolist poet and socialist enthusiast Leonce Fabre Des Essarts was consecrated (Tau Synesius). It is said that the Countess d'Adhemer (a close associate of HPB) was designated as Tau Valentin's "Helen"(6). Then comes the most amazing twist of these events. : In 1895 Doinel hesitates in the midst of fast moving energy, begins to doubt, and probably due to the Palladium controversy (coming to light this very year), Tau Valentin abdicates his office and returns himself to the obedience of the Holy Latin See (Rome). Finally in the same year, Papus, Synesius, Sedir, Chamuel and other convoked a sacred synod to ratify the Eglise Gnostique and apparently to abjure the defection of the Patriarche Valentin as well as to designate his successor who would be Tau Synesius. All this took place once more in the oratorie of Lady Caithness who was to die in November of the same year. Thus completes the birth history of the Gnostic Church of France, later to be known as Eglise Gnostique Universelle and more recently Eglise Gnostique Apostolique. Having surveyed the above history of these two great hierophants, one oriental and the other occidental, (like the double eagle itself,) one would be sadly remiss to deny their place and prominence in the formative energies of their spirits in the gnosis of our age. For both of these great lights came together at precisely the right time and in the right place and happenstance to light the candle of Gnosis. For our part, it seems to me, the only thing lacking is our own capacity to recollect the important history and the valuable contributions, no matter how incidental they may seem, of those gone before us in the sign of Gnosis. Finally and most importantly in my opinion, is the recognition that both the Russian Sphynx and the Balzac of the occult died at the heights of their geniuses and accomplishments, for reasons known only to providence. But it occurs to me that the Societe's created from them and under them, existing in the present day, have no less the obligation and duty to carry forth and increase the very light with which they have initiated the globe. (1) The name 'Valentin' is sometimes rendered in its latin form as 'Valentinus'. (2) "Papus", Balzac of the Occult, by Phillipe Encause. Rob. Beleond Pub., Paris 1979. “‘HPB’, Modern Gnostic” (American Theosophist May, 1988), by Stephan Hoeller. (3) Dr. Hoeller refers to the following for a more exact approximation of HPB's quotations of Levi. Theosophy: Modern Revival of Ancient Wisdom. By Dr. Alvin Boyd Kuhn. Henry Holt & Co.
(4) Madame Blavatsky - The Collected Writings: Vol. 13 1890-1891. Pages 1-60. (5) At the Crossroads of Hope, By H. H. Johannes Paules II. (6.) "Il Retorno dello Gnosticismo", Massimo Introvigne. Crnago Italia Sugar Company Edizi-oni 1993. (Pages 106-108). Special thanks to Dr. Stephan Hoeller for his insightful advice and Rev. John Cole for editorial assistance.